The Law Institute of Victoria’s (“LIV’s”) Accredited Specialists Program has over 900 Accredited Specialist Practitioners who are accredited as Specialists. They are recognised as having an enhanced skill level as well as substantial involvement in established legal specialty areas. This select group of solicitors account for only 6% of Legal Practitioners in Victoria. The LIV requires such specialists to demonstrate superior knowledge, experience and proficiency in a particular area of law to ensure that services ensure that services provided by Specialists are of the highest standard. 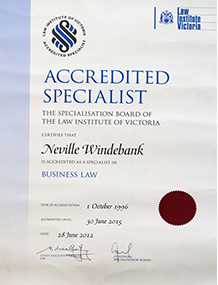 Mr. Neville Windebank is an Accredited Specialist in the area of Business Law.